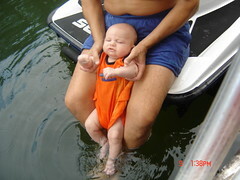 Dr. Tracy, Melissa's father-in-law, giving Austin his first lake experience. He also got out on the boat but slept through that. this is great!! Jammy's parents will be very grateful for your photos later on down the road. Hang on tight to them! Frame them! Put them in an album!